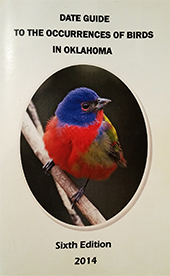 Use the main menu list for a guide to birding locations in Central Oklahoma. 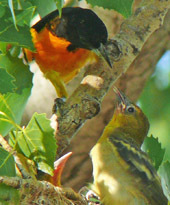 Click here to join the Oklahoma City Audubon Society or renew your membership. Click here to view the results from the Oklahoma City West Christmas Bird Count. 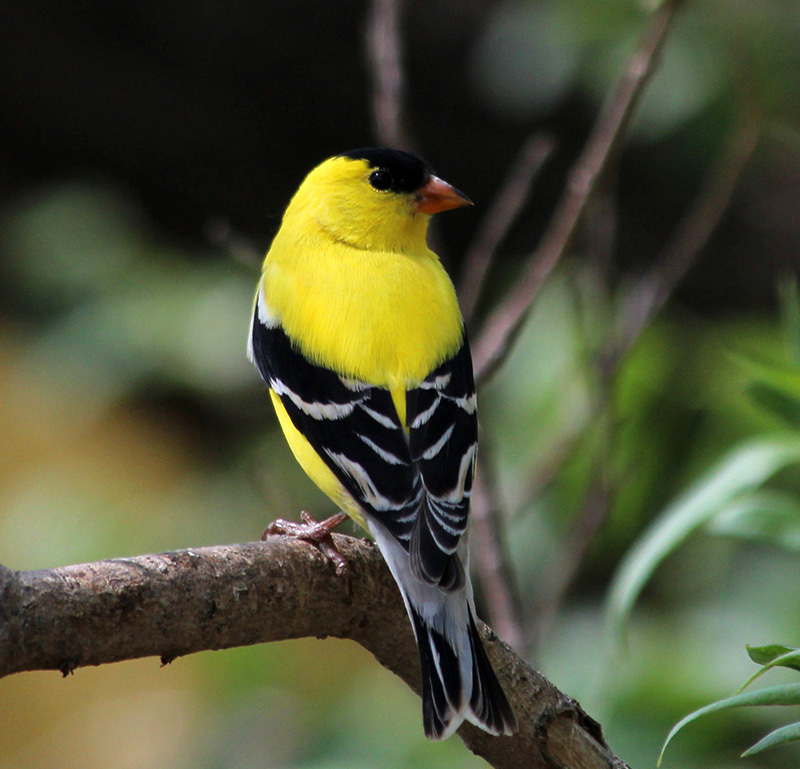 In the September 2014 club newsletter, Patti Muzny had a wonderful story about the American Goldfinch (Carduelis tristis), a pair of which came to her thistle feeder all summer long—because she kept the thistle feeder going. Later in the summer a 3rd goldfinch showed up that may well have been a young bird raised by Patti’s original pair. I know of no other report of such a thing happening. (Others might have similar stories and thus it may be me who is out to lunch.) But at least to me Patti’s observations are quite remarkable and I would like to discuss the goldfinch further, to help highlight what I see as fun and positive aspects of Patti’s observations. The American Goldfinch presents two “faces” to Oklahomans, depending on season. The male goldfinch is a thing of beauty in breeding plumage, with its hurt-your-eyes yellow. But we rarely see the bird over summertime because we are near the southern limit of the species’ breeding range. One of my recollections of seeing them in summer is of a pair of birds in bounding flight, maybe 50 yards away, and going further. This is not like winter, when we come to expect them only a few feet away at our feeders. There are some interesting things about the nesting of this goldfinch. It builds a very tight nest with things like thistle down. The nest is so tightly woven that if there are young in the nest and a hard rain comes, the young can drown, apparently because water is so slow to drain through the nest; this was reported to A. C. Bent (1968, Life Histories of North American Cardinals, Grosbeaks, Buntings, Towhees, Finches, Sparrows, and Allies, part 3) by Arthur A. Allen. Another thing about the nest is that this goldfinch nests later than most species of birds—which can mean they are nesting during our really hot summertime days, July and August. During these times it is reasonable to believe that sometimes the young in the nest may succumb to our summer heat, because the tight nest probably also holds much heat. This may even be part of the reason the species does not nest too far south of us—it may just be too hot for the young to survive in the nests during really hot summers. On the positive side, late nesting by the goldfinches means avoiding most cowbird parasitism, because cowbirds have usually stopped laying eggs by July. As to nesting, this goldfinch can lay 4-6 eggs, but usually 5. One summer when several of us were doing some serious bird banding in a willow thicket at the north end of Lake Overholser—banding carried out under Warren Harden’s permit and guidance—Warren and I found a young goldfinch which could just barely flutter short distances. We told Dr. George Sutton about it and he urged us to try to find the nest. He said it should be quite near where we originally found the young goldfinch. We returned to the banding area and sure enough we found the nest about 10 feet high in a 12 foot high willow. Fall is now here and soon we will see the other face of the American Goldfinch; they will filter down from the north and flocks of them will start to show up at our feeders, giving us great looks at them from only a few feet away. But these goldfinches—including male birds—now usually have a lot of drab olive-brown in their plumage. In Oklahoma, this finch is at or near the top of the list of the most frequent feeder birds. Thistle feeders are especially favored by the goldfinches; unfortunately thistle seeds are expensive, so many feeder watchers do not put out thistle seeds in winter, much less in summer, like Patti did. As mentioned at the beginning of this discussion, Patti found the goldfinches showing their 2 “faces”—both summer and winter—at the same time at her feeders, a great coup, in my opinion! Such bits of possible changes in bird behavior give me hope that at least some bird species will be flexible enough to withstand the altered types of urban habitat we humans are creating.